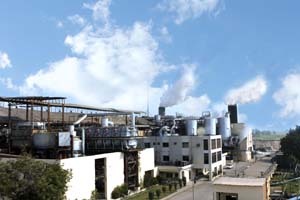 Habib Sugar Mills Limited was incorporated as a Public Limited Company in 1962 with its Head Office in Karachi and its plant located at Nawabshah, 300 kilo-meters north east of Karachi. The original machinery for the sugar division was supplied by M/s. B.M.A. of Germany and the process was Double Carbonation Double Sulphitation (D.C.D.S). The capacity of the plant at its inception was 1,500 tons of sugarcane crushing per day. The mill commenced its production in January, 1964 and was the second sugar mill in the province of Sindh. Present capacity / capability of the mill is 7000 tons of sugarcane crushing per day. The capacity has been enhanced by balancing, modernization and replacements (B.M.R) as well as change in manufacturing process from Double Carbonation Double Sulphitation (D.C.D.S) to Defecation Remelt Carbonation Sulphitation (D.R.C.S.) also under B.M.R. during the last three and a half decades in various stages of implementation. 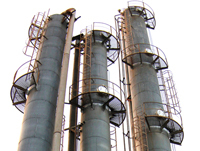 In the year 1967-68, a Distillery to produce methanol from molasses was added to the plant. The machinery / equipment for the distillery was supplied by M/s. Spechim Limited of France. This distillery division has over the period of time contributed handsomely to the profitability of the company, besides boosting its export. In the year 1978-79, the management decided to diversify into other fields of manufacture and established a textile division at Karachi. The produce of the textile division is mainly exported. The company also set-up a tank terminal in the Port area of Karachi for purposes of handling and storage of bulk liquid cargo such as molasses, edible oil and methanol. The company has made steady growth over the period of time. As at April 2002, the capital base of the company has increased from its inception level of Rs. 12 million to Rs. 750 million as a result of issuance of bonus and right shares from time to time. The company’s performance since inception has been satisfactory as is established by the trend of efficiency, growth in earnings and financial stability. Hand-in-hand with the prosperity of the company, the shareholders have been correspondingly rewarded by a consistent policy of the Board of Directors towards payment of stock and cash dividends. The company was awarded Trophy and Certificate of Merit by the Karachi Stock Exchange (Guarantee) Limited in 1980, 1981, 1982, 1983, 1986 and 1990. Further the selection committee of International Gold Mercury Award selected Habib Sugar Mills Limited for awarding their International Award in 1982. The company was also conferred the award for the highest sucrose recovery throughout Pakistan by the Pakistan Society of Sugar Technologists in their 25th Annual Convention held in 1990. Duration of the crushing period be reduced as far as possible in the interest of farmers. Extract maximum sucrose contents by crushing the available quantities of sugar-cane in more conducive climatic conditions. Continue to improve the quality standards of its products. Increase overall efficiency in operations so as to control wastage and optimize capacity utilization. The satisfactory performance and the growth in turnover and profitability of the company is due to hard work and excellent efforts put in by the workers, staff members and full co-operation received from our sugar-cane farmers. The company continues to attach great importance to a pollution free environment and have installed fly ash removal system and slop treatment plant in its sugar and distillery divisions respectively, involving a capital outlay of approximately Rs. 60 million. The fly ash removal system installed in the boilers of the mills has completely eliminated the spread of black soot particles. Similarly, the slop treatment plant has fully eradicated the unpleasant smell from the distillery. By the Grace of Allah, successful operation of these projects have ensured a pollution free environment for the citizens of Nawabshah. A team of Sindh Environment Protection Agency (SEPA) visited the mills at Nawabshah in 1995 and lauded the efforts of the management in ensuring a pollution free environment.